It takes longer to diagnose memory problems in a patient than the current 10-minute slot for a GP appointment, experts have warned. The call comes after researchers suggested the 10-minute appointments could be having a negative impact on dementia diagnosis figures. 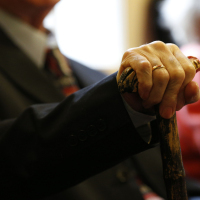 The number of people diagnosed with dementia rose in 2015, however it was still below Government targets, according to a team at Imperial College London. Ministers have pledged to diagnose 75% of the population living with the condition by 2017 but the figure for formal diagnoses in 2015 stood at 62%. Researchers at Imperial called for an 'urgent review' into how patients are assessed for referral. People suspected of suffering dementia are referred by their GP to a memory clinic for a formal diagnosis to be made. But the GP must first carry out a series of tests. They say 10 minutes is not enough time for a general practice doctor to assess a patient for memory problems, citing the complex criteria that needs to be met before making a referral. A leading dementia expert also questioned the practicality of trying to diagnose during a single GP appointment. George McNamara, head of policy at the Alzheimer's Society, said: "The condition can be incredibly complex to diagnose, potentially requiring multiple tests and assessments - it would be rare for a diagnosis to be made in one 10-minute visit to the GP." Dementia affects 850,000 people in the UK. You can arrange Alzheimer's travel insurance if you're planning a holiday with someone who suffers with the condition. The study was published in the Journal of the Royal Society of Medicine.